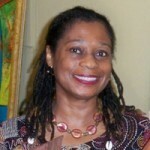 Marion is a poet, short story writer, essayist and attorney. A graduate of Cambridge University, she has been working as an attorney since 1986. Marion’s writings have appeared in WomanSpeak, The Caribbean Writer, BIM, Poui, Callalo and The Massachusetts Review; and anthologised in numerous works such as Moving Beyond Boundaries, Wheel and Come Again and MaComere. A James Michener, Cave Canem and Bunting Institute fellow, Marion has been a guest writer at the Miami International Book Fair, the Caribbean Women Writers Series, in International Poetry Festivals of Medellín, Granada and Bolivia, the International Writers Workshop, Hong Kong and the St. Martin Book Fair and the International Poetry Festival of Granada. Marion’s first volume of poetry, Guanahani, My Love, won the prestigious Casa de las Américas Prize. It was published in a bilingual edition (Spanish/English) in 1995. Guanahani, My Love, was re-published in March 2009 by House of Nehesi Publishers, St. Martin, WI. Her latest poetry collection, Bougainvillea Ringplay, was published in 2009 by Peepal Tree Press, Leeds, England. Marion is currently working on a third manuscript of poetry and a novel. Her vision is the driving force behind the documentary. A woman of Greek, Scottish and Bahamian descent, Maria's creative voice is deeply rooted in a dialogue with her home, the Bahamas. Her first film, Junkanoo: The Heartbeat of a People, celebrates the spiritual and creative life force of Bahamian culture by exploring the African rooted festival-tradition of Junkanoo. Her subsequent work is an intimate look at the somewhat shattered lives of three Bahamians living with HIV. That film, Where I'm From: HIV and AIDS in the Bahamas, was an official selection at the Bahamas International Film Festival where it received wide support from both the local audience and visiting filmmakers alike. Rain, Maria's debut narrative feature film, premiered at the Toronto International Film Festival in 2008. Rain was awarded special mention in the New Visions competition at the Palm Springs International Film Festival, Best New Director at the Pan African Film Festival, Graine Cinephage in Creteil France, Best Film for Youth in Seoul Korea, and has won numerous audience awards along the way. Rain most recently premiered on Showtime Networks where it has garnered a great deal of positive audience response. Maria is currently in the development of her next film projects, Epiphany and My Life in a Dojo. Kareem is a Bahamian filmmaker that has worked globally. Over the past five years he has won over 25 awards for his last three film projects and has had his work distributed in over forty countries. Kareem has made short music documentaries for the syndicated show Hip Hop Nation: Notes from the Underground, and has written and directed the short Narrative film Float, which won 5 international awards and distribution in five countries. Float received a Broadcast premiere on LOGO. Subsequently, he directed the documentary I Am Not A Dummy and the feature film Children Of God. Children of God won 18 awards, was distributed in 24 territories, and had theatrical releases in the US, Netherlands and UK; it is currently airing on SHOWTIME. Children of God was also named by BET as one of the Top Ten Movies Of The Year and one of the Top Features to Watch by The Independent. Kareem has also enjoyed a career as an editor and served as an editor for four feature documentaries including Womanish Ways. He is currently involved in pre-production for a short film that he will direct this summer and fundraising for new projects. Natalie obtained her BA in Development Studies and History from the School of Oriental and African Studies, University of London in July 2011. Following her return to The Bahamas, she became involved in the Women’s Suffrage Movement Project in The Bahamas, conducting research, photographing historical sites and coordinating interviews with the Movement’s founders and supporters. Currently, Ms. Bethel is the Economics Research Fellow at the Inter-American Development Bank in Nassau, Bahamas and hopes to continue her studies at graduate level. Her interests include: socio-economic development, gender equality and microfinance. She enjoys research, photography, politics, travel, and networking. Gabrielle graduated from the University of Richmond in May 2011. Her degree focused on ethnomusicology and women, gender and sexuality studies and she wrote a senior thesis entitled: Contemporary Bahamian Music: A Lens Through Which to Explore Bahamians' Creation of Their Post-Colonial Identity. Gabrielle’s research interests encompass folk and traditional music and questions of individual and national identity formation, especially where the Caribbean is concerned. She hopes to pursue the intersectionality of these topics through graduate study in ethnomusicology. In addition to her contributions to the documentary, Gabrielle is assisting with other areas of the Suffrage Project, working to make information about the Movement available to the public. She enjoys playing the piano, drumming, baking, jogging, and being outdoors. We acknowledge and appreciate the additional professional and technical support provided by Erika Robinson, Kevin Taylor (DreamKatcher Media) and Daniel Bayssassew (King of Hearts Media).